The first week of school nearly always comes as a shock to my system. Getting up early and making lunches for the whole family. Attending classes and thinking about new things. Walking a lot more with a nice heavy pack on my back. It all wears me out. I take comfort in knowing that I will be fully adjusted in the next couple of weeks and won't think twice about all of this. This weekend I didn't have to do homework becuase I worked hard this week, and got everything done by the end of the day on Friday. So instead we did domestic things around the house, did some shopping for art supplies (which is a constant thing in this house) and harvested the rest of the veggies in the garden and cleaned up the planting beds. My plan is that cleaning up now means a lot less cleaning up in the spring before planting. My mom and step-dad are coming over for supper tonight. We are having a family dinner, with the ulterior motive being to have leftovers for suppers during the week next week and easing off the cooking burden a bit for myself as well. So really the end of the week was pretty great. I also cleaned out my ArtFire Store this weekend and got rid of a lot of stuff that just wasn't selling. Clearly you can make some fun things, but if they only appeal to you then leaving them in a store for 3 years to sell is just taking up space. I'm going to recycle, or reuse those pieces for something else - probably at school. I have started to list some of the really beautiful prints that I made last year for sale. They are very limited editions (either of 5 or of 10) and I love them, but I can't house a hundred prints in my space. So I'm selling them in the hopes that they will find a new home, and that I can buy some more art supplies with the proceeds. One of the first ones that I have listed is this really fun print called "The Moon is a Harsh Mistress" that is an etching using two processes and a collaged piece from the book of the same name by Robert Heinlein that I found about to be thrown out because the binding had given out. So I made space ships out of it. It seemed fitting. This piece was made for my husband, but once again, how many can he hang in his office? So, week one is done. Week two starts in 15 hours. Naturally I'll be keeping you posted. Is It The Best Of Both Worlds? I love writing. I am actually not bad at it either. I was going to apply for a job writing columns for a daily art blog, because I thought that it would be the best of both worlds. But it turns out that they wanted columnists for specific topics only, and that I needed to turn out a large number of columns monthly (at least 9). Now, I have to admit that my attention span is pretty short, and the idea of writing 9 columns a month on the environment and art, or art techniques, forever, well it leaves me a little cold. I am not interested in reading 9 columns a month about those things, why would I be interested in writing them? Also, 9 columns a month is lot of time that I wouldn't be spending making art, which is my over-riding passion these days. That being said, I was really excited about writing on a regular basis again. I love writing my blog, and I love writing other things. Writing isn't always easy for me. Sometimes I find it physically difficult to sit down and write. Sometimes I find that the demands of my day job (aka being mom) are such that I can't write as much as I would like. But I do like to write and I would like to write other things that are more challenging than baring my soul, and my personal life in this blog. You know, I'm not a bad writer, I've received honourable mentions in three writing contests. I think this is something that I would like to do again. So when I stumbled upon Squidoo this week I thought, now this is something I could do. It's not a column, I can write about the topics I want, when I want to write them. It's not a blockbuster money maker either. But, it is a wider audience, that is as diversified in it's interests as I am. So, I'm going to start creating lenses on Squidoo. I actually worked very hard on making one today, that is a demonstration painting of a technique I like to use. I would really love it if you went to have a look, and even more so if you would give it a rating. If I make more, I'll link them up here so you can have a look. In the meantime it's back to the pendants that are flying off the shelf at Artfire. My second job! We took a cab to Long Island City, where the gallery is. I actually had to get out my map and give the cabbie directions to where we were going. That made me chuckle. The gallery looks like a warehouse from the outside and looked like an insane asylum from the inside. I'm sure that several fire codes were being broken that night. The crush of the crowd was amazing. I found my paintings and got some pictures, got to mingle with the crowd, and got a little freaked out by the masses at a couple of points. In the end I was delighted, but not overwhelmingly so. Really after seeing some of the amazing art that was hanging with mine I was more determined to get home and start working on my new pieces and make them even better than I had dreamed. We grabbed a cab and headed back into the city to the Odeon(for which I had to take out my map again!) for burgers. (there is another blog coming up regarding dinner – but, as they say, that's another story)). It was a nice way to end the evening. My husband and I stood very close to each other and talked about us while we waited for our table, instead of talking about the kids and the bills or the house. I think that was probably the best part of the night. I did more sketching on the subway back to the hotel and happily fell into bed for a very short night's sleep. I opened up the document that I draft my blogs in, and saw that the last line of typing was: January 26, 2009. It seems I was about to write a blog on Monday, but something happened. I have no idea what it was, but since I have both kids and husband still in reasonably good shape, I would guess that it was something non-life threatening. This week I took “Surveying the Kingdom” in for a rush framing job, so I can hand it over to my friend Cathy for a charity auction benefiting Brown Bagging it for Calgary Kids on Friday (that would be tomorrow!) The event is next weekend - so I better find something to wear! I varnished, and put hangers on all the paintings that are going to New York, and I'm handing them over to the shippers tomorrow too. I volunteered at the school for the kids, and I attended a painting class. I cooked, cleaned (yada, yada, yada) and all the usual stuff, and took my daughter to the allergist, and I'm still facing my busiest day of the week tomorrow. What does this actually mean ....? Well for me it means I get to order Chinese food for supper tomorrow and drink a glass or two of wine to celebrate making it out with most of my sanity intact. I was painting all afternoon, and the good news is that the dragonfly is nearly done! The bad news is that the witty, insightful, award winning blog entry I was contemplating while I was painting got swept away by the hurricanes that are my children returning home from school! I think it had something to do with materials. Or maybe it was something to do with forgetfulness... or parenting, making snowmen, eating popcorn, or Indiana Jones. Perhaps it was about crazy cats who attack their food dish for now reason (that I know of) or forgetting your lunch, or drinking too much coffee, or iMix playlists. Wait I think it's coming back to me, it was about stuborness. No, that's not it, hang on I know it will come to me if I try harder. Gratitude? Chocolate? Shopping online? My Mom? Dammit. Maybe it was about fingerprints, or aliens, or bad hair days, or weird weather. The importance of taking time off, or macaroni and cheese. Maybe it was serendipity? It had to be one of those things. I'm sure. I wish I could remember. Oh well. The good news is that I think I have the shipping for the paintings to New York under control, and I only need 15 more trading cards made up for the class on Friday. I am very, very close to finishing my fourth painting, and then it's putting the final touch on the fifth for the show and I'm set. The other news is that I'm bone tired, and going to bed. Goodnight internets! Yesterday, which was the day after my daughters' birthday party, (both girls invited friends to join us at the Science Centre to celebrate their birthdays) my girls were playing with their new loot and after having filled their spaces at the dining room table with toys and toy accessories, started to encroach on my space. On little bump of a book and my full coffee cup was spilled into my laptop computer. I was more than a little excited trying to clean it up. I know it was an accident and I didn't yell – but I did have a short discussion about respecting other people's space. The computer was left to dry out for the rest of the day and night, and I spent a restless night worrying about all the scans and photographs I had of my artwork that were only on my laptop, and nowhere else. This morning, before I even got coffee (wanting not to tempt to the technology gods to making more mayhem) I pushed the lovely blue button and was rewarded with the opening chords of my start up screen. All is well (so far) and I spent the day organizing and backing up all my files – especially my photographs, reference photos and art scans. 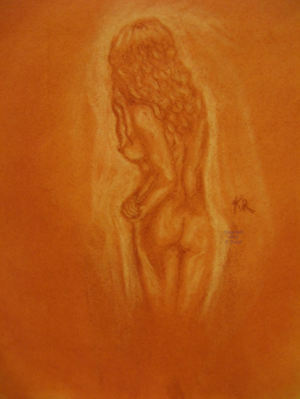 This is an untitled pastel drawing that I finished mid-week and I am really quite happy with the softness of it. I toned the paper first, and then I used a darker colour for the darks and lifted the colour from the page for the lights with an eraser. It almost feels candle-lit. And I am really happy with how this new exploration of pastel work is turning out for me. I exchanged notes with one of my mentors this week, and I said that it seems that the more I kick myself out of my comfort zone the happier I am with the work I am producing. She encouraged me to stay out of the places where I am too comfortable, because I am growing. It was wonderful to have her comments on my new work, and it feels good to be stretching my skills. In my creative life so much of what I do that isn't actually putting pencil, paint, or charcoal to paper, centres on my ability to have access to a computer and the internet. I worried about what I could accomplish today without my computer. Of course the reality is that I could probably accomplish quite a bit, but it just wouldn't be the same. And despite my abilities to stretch myself out my comfort zone... I really don't like change. Sometimes being a mom and being the person who kisses boo-boos, finds the stickers, and knows how the grilled cheese sandwich needs to be cut can be overwhelming. After a morning spent with the whole family (husband included) I am exhausted. Because I am supposed to bring the snacks, the drinks, the coffee money, the tissues. I'm supposed to know where we are going, in what order. I am the one who has to kiss the pinched finger better when daddy clips it into the car seat, and provide Lifesavers to the tear stained child to get her to settle down for the trip. but other than that it's just been mom work. Why is it that mom's never get a holiday, even when the family is on holidays? Responsible bloggers don't drink and blog. Although it can be funny when they do. I have read more than one drunken raving on a blog. And you may or may not have read one here. I will admit that there have been times that I have written a blog with a glass of wine at my elbow (today being one of them), but since I write a lot of my blogs at the library (in the relative quiet found there) and they frown on bringing your own bottle, I write most of them painfully sober. I will also admit that the giddiness that I feel sometimes in just getting the words out can make me feel a little drunk. But I try not to make it habit to write under the influence (or paint under the influence... unless I'm under the influence of coffee... my only serious addiction). I feel that I owe my readers and the customers of my art a certain amount of lucidity. However if you go to Technorati and type in “Drunk Blogging” you will get, roughly, a zillion results. I guess blogging and drinking are more common than we think... but it's OK – as long as those bloggers aren't driving too! Speaking of responsibilities – don't forget to check out my Featured Artist of the Week.